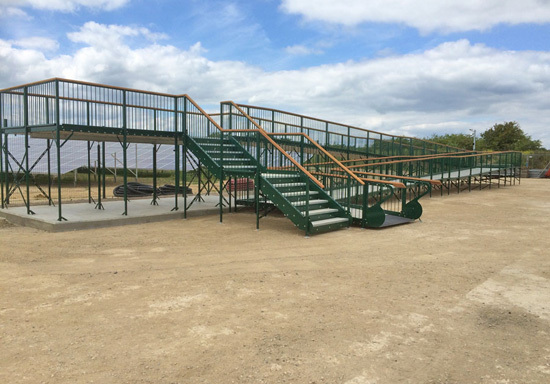 A fast permanent or temporary solution to Embankment steps offering the stability and longevity expected from a permanent structure in the shortest possible time frame. 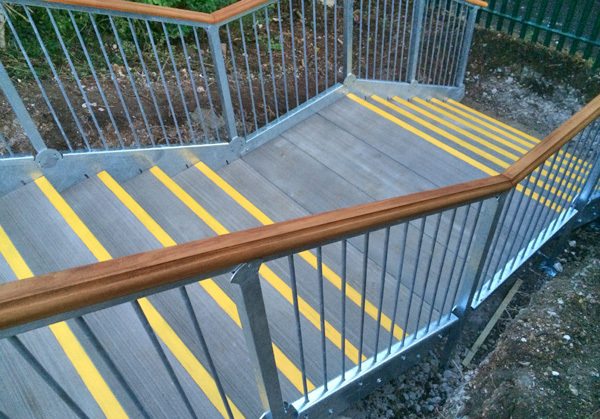 The concrete tread plates offer the ultimate anti - slip surface and strength required. 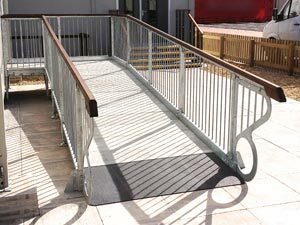 The Balustrade design to both sides of all of our products, make them particularly safe for children. 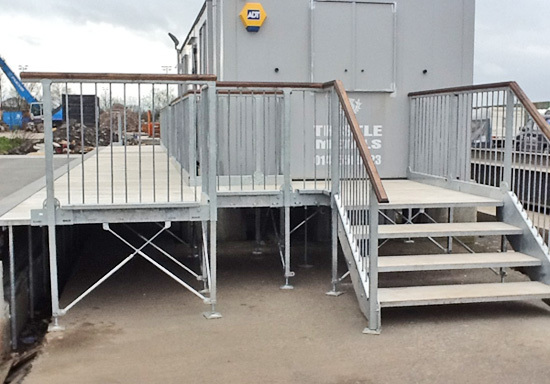 Platforms can be located where required and can be designed to suit individual requirements. 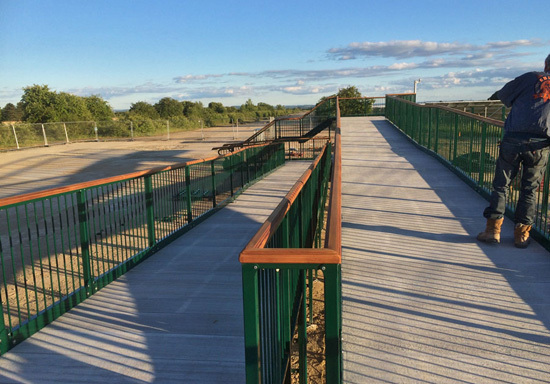 With a background in Civil Engineering our design team are used to constructing things that are built to last. The Averamp system is no exception. 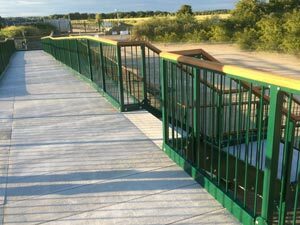 The concrete base plates offer exceptional strength and stability and are Brush finished - the equivalent anti-slip specification for a permanent floor. Manufactured in the UK all our materials are to British Standard assuring you of the very best quality. 1.875 meters 1.5 meters and 1.125 meters with various configurations available. 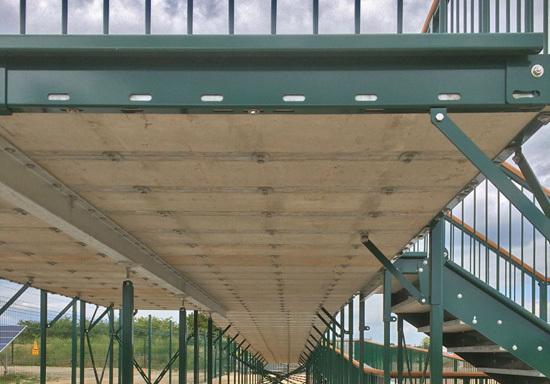 Reinforced Concrete tread plates offering the ultimate anti - slip surface, strength and stability. Part M Building regulations and DDA compliant. 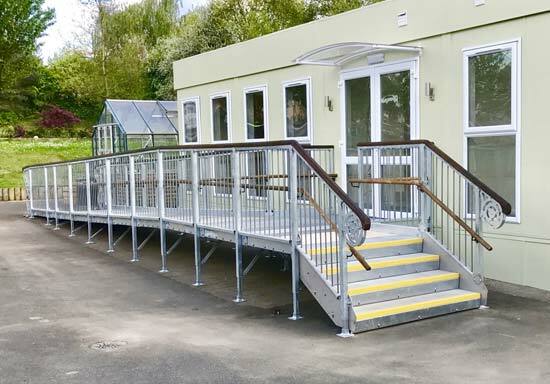 Chid safe Balustrades the system has been used in numerous school projects. Galvanised as standard with Powder coating available as an option. Tread plates can also be coloured if required. Call us today for a free quote or to ask any questions you may have, our staff are a friendly bunch and we would love to hear from you. At Access Solutions we recognise our customers’ needs for careful planning and efficient budgeting. 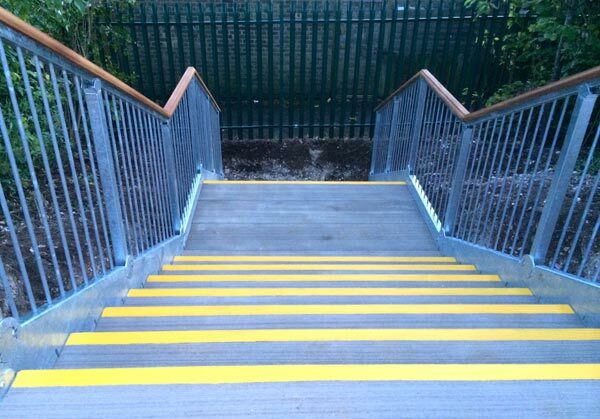 Wether you are a public sector facility or a private company we aim to provide a service tailor made to your needs, so we offer flexible finance options and operating lease contracts for purchasing modular steps or ramps. Buy Back gives you the option to purchase one of our systems and then to re sell it back to us at a later date for a percentage of the original price. We have a team of fitters who are friendly and take great pride in their work which is carried out with the minimum of inconvenience to you. They are polite and work tidily to ensure maximum customer satisfaction. Our manufacturing team has many years of experience, and we aim always to carry out work to the very highest standards. 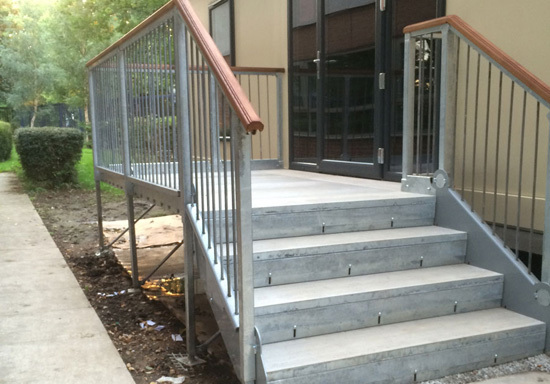 As standard our steps and ramps are supplied with a Galvanised finish. The concrete plates been the natural colour of concrete which is a light grey. 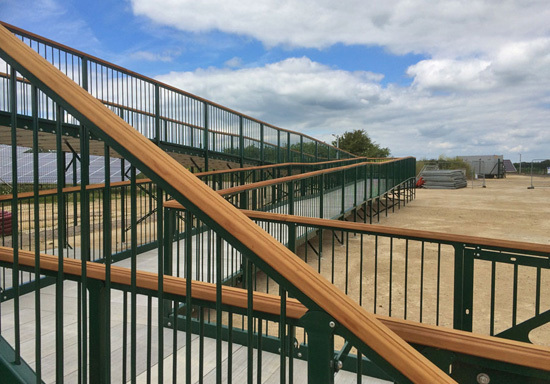 For the timber handrails an exceptional five star timber stain is used. 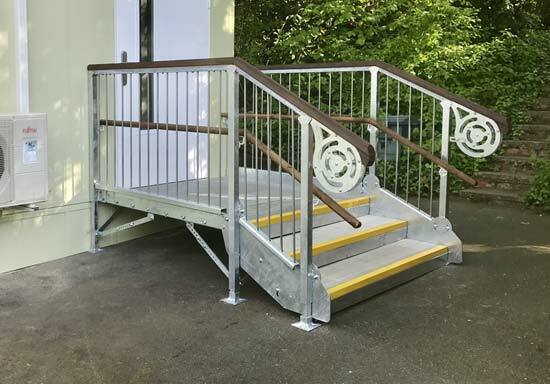 Galvanised as standard to maximise lifespan, we also offer the option of powder coating the steel framework of your steps and Ramps. All we require from you is the RAL colour in order to quote you.